On July 29th the Cambodian people voted for their representatives in the General Assembly. The only issue? Cambodia has become a one-party state ruled by the Cambodian People’s Party who got rid of their main opposition, the Cambodia National Rescue Movement and its leader Sam Rainsy, in November 2017. The year was 1978: Cambodia was being freed by the Vietnamese army, who invaded and occupied the country to liberate the Cambodian people from the cruel and oppressive Khmer Rouge regime. The communist government was close to the Chinese ideals of Mao Zedong, praised poor farmers and considered the middle class as the greatest social Evil. The Communist Party of Kampuchea took over on 17th April 1975, when they entered the capital Phnom Penh after defeating the pro-US government: the city was finally freed in January 1979, but in the meantime the Angkar had killed about 3 million people out of 7 million, which makes the Cambodian civil genocide one of the worst in the entire global history. Current and very likely to be future Prime Minister Hun Sen is a former Khmer Rouge soldier who fled to Vietnam in 1977 to escape the schizophrenic and paranoid purges of Pol Pot. Supported by the Vietnamese army and government he became soon a great political exponent, first as Minister of Foreign Affairs and then Prime Minister: he has been ruling Cambodia since 1985 and has planned to be the strongman of the country for another decade. Elections in Cambodia have not always been smooth and fair and Hun Sen has always come up with a “diplomatic” way to figure things out and stay in power. His campaign benefits from partial truths about Cambodia: the country is one of the fastest-growing economies in South-East Asia, especially due to Chinese investments, and the dissolved opposition could not guarantee that this boom will continue. On the other hand, the plague of the Cambodian People’s Party (CPP) is corruption, one of the main themes of the counter-campaign of their former political opponents, the CNRM (Cambodia National Rescue Movement). These also share strong anti-Vietnamese and nationalist ideologies, which remind a lot of those feelings before the war. 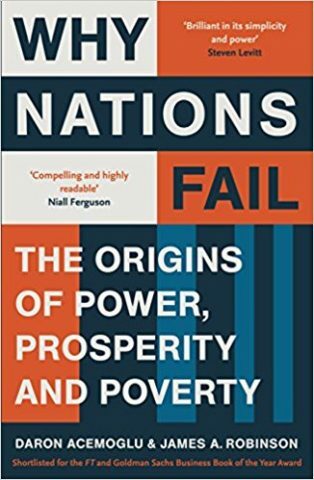 In 2013 the CPP risked losing seats to the CNRM: the first ruling party gained 55% of the seats (68 out of 123), while the opposition 45%, even though they claimed that they had won the elections. Political demonstrations against the results of the elections and the CPP took place in the capital Phnom Penh: Cambodia was successfully becoming a two-party state but the Prime Minister could not accept the new system. At the beginning the two parties tried to create a conjunct government and work together, but the cooperation did not last and Hun Sen found a way to get rid of his main and only opponent. The CNRM was legally dissolved in November 2017 by the Supreme Court, who accused the party of conspiracy with the US to stage a revolution: evidence of a speech held in a factory, where the leader of the party, Sam Rainsy, was announcing an almost “red” revolution was scary enough to ease the legal dissolution due to reasons of national security and public order. Both the leader and his closer supporters, who were imprisoned, are now in exile, but they tried to maintain leverage on their voters and called for abstention on 29th July 2018. It is estimated that the CPP won 80% of the seats and that Hun Sen is going to be again the uncontested Prime Minister of the country, although official results will be available in mid-August. Also evaluating how many individuals boycotted the election will be a pressing issue since abstention is believed to be high. Political and human rights observers and institutions condemned the election: it was not free and democratic, but very few international actors did really intervene. According to the government about 220 observers from 52 different countries were sent to Cambodia to monitor the election: it is a small and almost useless reaction of foreign countries, considering that the CPP is so powerful and that the other 19 parties usually do not reach 2% or are close allies to the CPP. The US and the EU withdrew financial support and political monitors, and especially the US passed an act (the Cambodia Democracy Act of 2018) a few days before the Cambodian elections, which still needs to be approved by the Senate. Japan did not send monitors as well, especially due to the growing influence of China in the area. Only the Chinese government approves of the elections and, of course, of their ally, the Prime Minister. Besides the fact that Cambodia has become a one-party state, there are other issues related to freedom and democracy that need intervention. Some reporters, journalists and radio speakers who were either against the government or merely impartial and able to denounce problems of the Cambodian society, were even killed in public spaces. The only transparent journal in Cambodia, The Cambodia Daily – All the News without Fear or Favor, was forced to close due to lack of financial support. Even some religious exponents of the small Catholic and Protestant communities were summoned to meet directly with a spokesperson of the CPP, whose mission was to remind that in Cambodia there is freedom when it comes to religious belief and that a different government, a CNRP government, could undermine this privilege. There was no need to get in touch with the Cham Muslim community, since lots of Chams are already in the highest ranks of the CPP. Although this is not consistent with the purposes of the article, it is interesting to underline that even the Cham people (Cham and Khmer people are two different ethnic groups who usually rely on different religions, that is to say Islam and Buddhism) have experienced a change in their traditions: Saudi Arabia is trying to extend its influence to Cambodia too and to spread Wahhabism by financially supporting the Muslim centers. 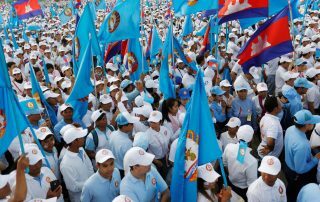 If you visit Cambodia it is impossible to miss out the light-blue posters of propaganda of the Cambodian People’s Party located every 10 meters: why? Because they are the only party who can afford this strategy, thanks to corruption and the Chinese approval. They also organize several parades to visit every village in the country: when it comes to short visits, they can be recognized thanks to the traditional music and the colorful Cambodian flag representing the Angkor temple that follow them on their pick-ups, cars and motorcycles. Such events are almost pleasant and sometimes turned out to be political meetings to consolidate their support in the villages and gain new followers. 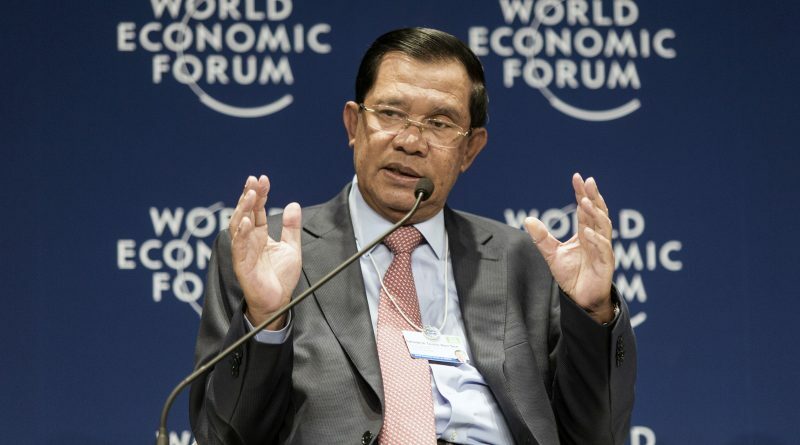 However, their strategy to increase their voters is a dangerous and unfair combination of threats and “candies”: several Cambodians overcame their fear and anonymously denounced the menaces of the CPP, such as not building infrastructure and especially roads, if the CPP had not won in the village. After such intimidations, exponents usually turn around, smile and ask who would like something to eat and also, who would like to eat, so that they can start distributing money (usually $5-10) to the every single inhabitant of the community. Candies, money and pressure is also how they won back in 2013, even though many Cambodians were very perceptive and did not fall for their promises and voted according to their conscience. Finally, it is true that Cambodia’s economy is growing really fast, thanks to the work of this government too, which is even more spectacular considering that they had to rebuild anything after the red shades of their past. The government is very open to any investors, but is now turning its back on the US and is selling off the country to China (Chinese influence is very clear in the South area especially). It is also true that the former opposition (CNRP) would have not been a better option for Cambodia, since their program was merely focused on fuelling anti-Vietnamese feelings and nationalism, and fighting corruption. 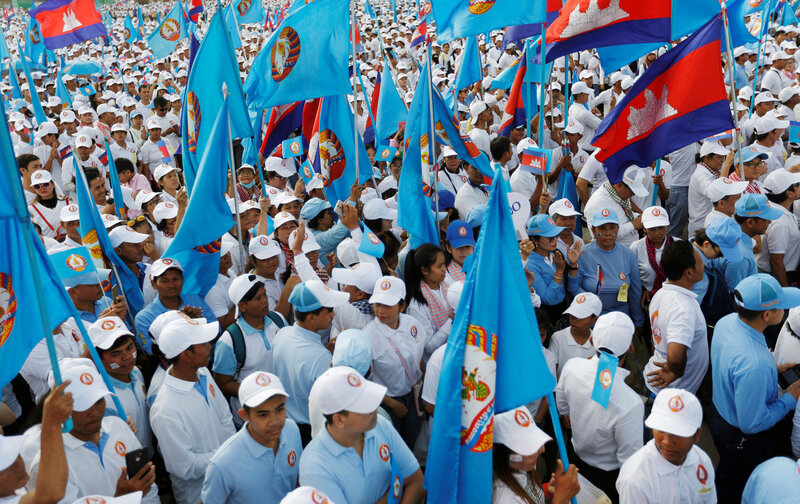 The atmosphere before the elections of 2013 was so tense that the Vietnamese minority was ready to leave if the CNRP had won. The economic awakening of Cambodia is bringing about a political one: Cambodians are asking for more opportunities, more rights, more freedom and equity. Hun Sen’s government has made the income of very few people grow and these discrepancies are tangible if we leave big cities and go to small villages. On 29th July Cambodia was denied the opportunity to say that they still want a change: for now, there is no party who is either able or worthy to respond to this need, we can only hope that the rising awareness of young minds will very soon. After all the sufferings, the smiling Cambodian people deserves to be listened to.